Dean Dimitruk hosts "Derailed Late Night." It’s not easy to break into the world of late-night comedy hosting. For 27-year-old Dean Dimitruk, the solution was to head underground. Where, exactly? New York’s L train on any given weekend. Dimitruk, originally from Philadelphia and son of late photographer George Dimitruk, is the newest late-night talkshow host to hit New York, broadcasting “Derailed Late Night,” a YouTube series that features Dimitruk; a portable, makeshift, late-night desk; empty mugs; and guests – yes, he interviews complete randos on the New York subway. Dimitruk, who is also a producer on "Dr. Oz," works alongside comedy writer Danielle Dweck to create the YouTube series, which currently has seven episodes. In an interview with Gothamist , Dimitruk said the idea came from his and Dweck's desire to make a late-night show featuring non-celebrities. “We kept saying that everyday people can be just as interesting," he said, "and it would be really fun to ambush them with a talk show." Ambush them he does, purposefully opting for late-night, weekend trains to catch riders when they are a little more agreeable to being involved in his show, rather than during the miserable, rush-hour commutes of the weekdays. 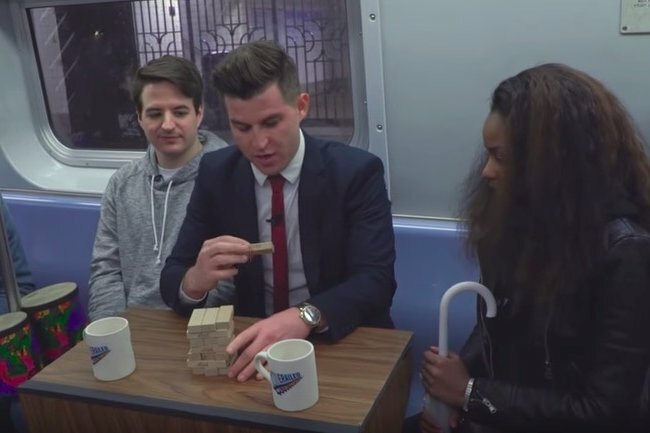 Dimitruk’s crew will spot guests at different subway stops and have them enter the train in DIY blue curtains, where they’ll then play games and answer questions. “When we get on the train, we try to get people excited by letting them know that they’re about to be on a late-night talk show and, like them, we have no clue who is about to get on the train,” he said to Gothamist. Surprisingly, Dimitruk and the “Derailed” crew hasn’t gotten much backlash from annoyed passengers. Though he admitted the general reaction is usually indifference, passengers throughout the videos seem at least a little engaged and interested, especially by New York standards. As “Derailed” gains traction, there’s even a chance Dimitruk could bring the series to SEPTA. “Our plan is to eventually expand it outside of just New York and go on other forms of public transportation,” he told Gothamist. Sounds like you should probably start practicing your wave to the audience.